I did a recent post showing some of my pumpkins but I just keep adding more. What is not to love? This time of year they’re everywhere – all shapes, sizes and colors – straight from the garden, carved, in the kitchen waiting to be made into pies or soups. Many of the ones I find around the grid are group gifts, or gifts from the shop owners to everyone who stops by. They are part of a bountiful harvest for all who love them. Another of my passions is candles. I keep a ready supply for dining or to place around our home inside – and out – when the wind isn’t up. I was looking for a fall grouping for a table on the side porch by our bedroom. . . something romantic, yet festive. 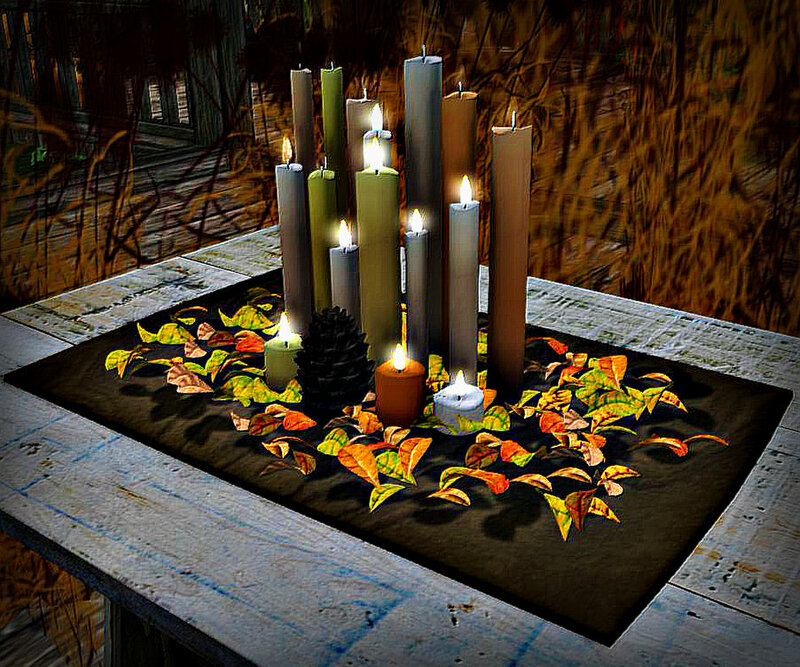 I found this great array of candles and autumn leaves on a place setting from the Aphrodite Shop and it was exactly what I had been looking for. 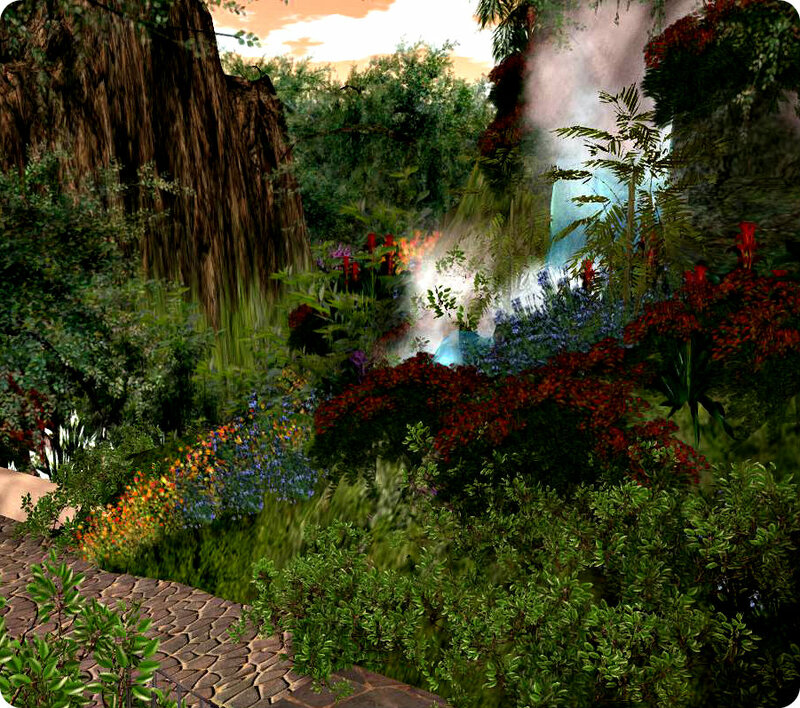 Jolie Artis is the owner of the new Camtasia Spa & Resort and she went to monumental lengths with her landscaping and sim design – and it paid off big time! I can assure you that every accouterment is in place to give maximum enjoyment and pleasure to all who visit. 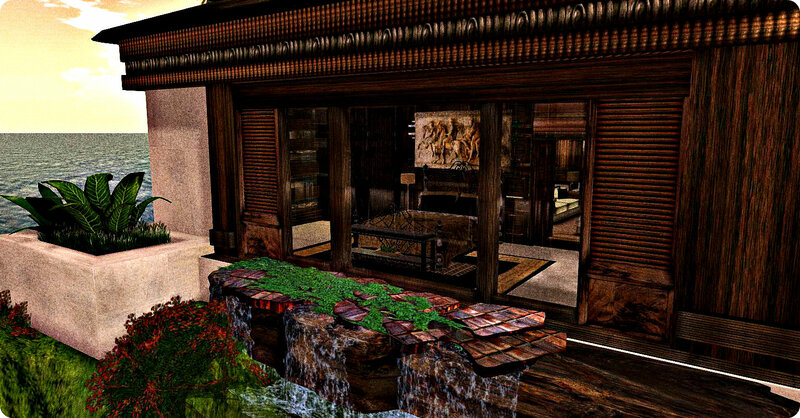 Luxury is evident everywhere you go and Camtasia should become one of Second Life’s premier spots for couples and ladies-who-lunch to spend time, relax and pamper themselves. No words or photo’s can come close to the reality. Located on the Seychelles Isles this alluring luxury retreat offers something for everyone. Buildings nestled amidst lush gardens and towering waterfalls, banks of flowers spilling down hillsides and over walls – the 3 sims are comprised of walking paths, beaches and activities, dancing, spa and resort activies – and also includes fine dining at Marina Ramer’s new African themed dining spot, the Author Cuisine Restaurant. I was curious about the name “Author Cuisine” – I don’t get out much LOL and it was new to me . . . so I did a bit of research and found that these type’s of restaurants offer a culinary voyage of artistic creations by the chef. Not a “have it your way” type of place where you send the food back because there isn’t enough mayonnaise or the burger is overcooked. Marina’s food offerings are exactly this, artistic creations! Congratulations on the opening of her second restaurant. 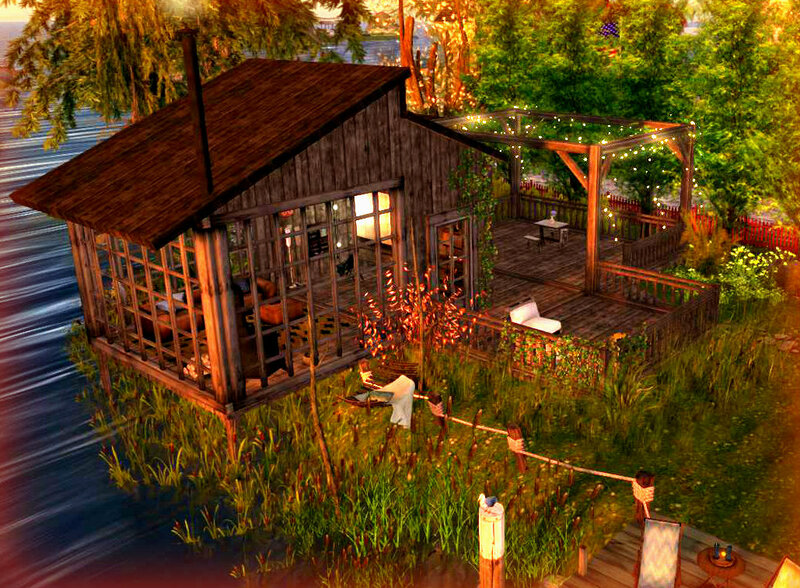 I was pleased to see there are a few home rentals dotted about the sim. Lovely settings, sailable water – so why not? The bungalow’s are by Eliza Wierwight of Patron and are sumptuously furnished, with an extra prim allowance for anyone who moves in. There are differing sizes and prices so take a tour of each one. 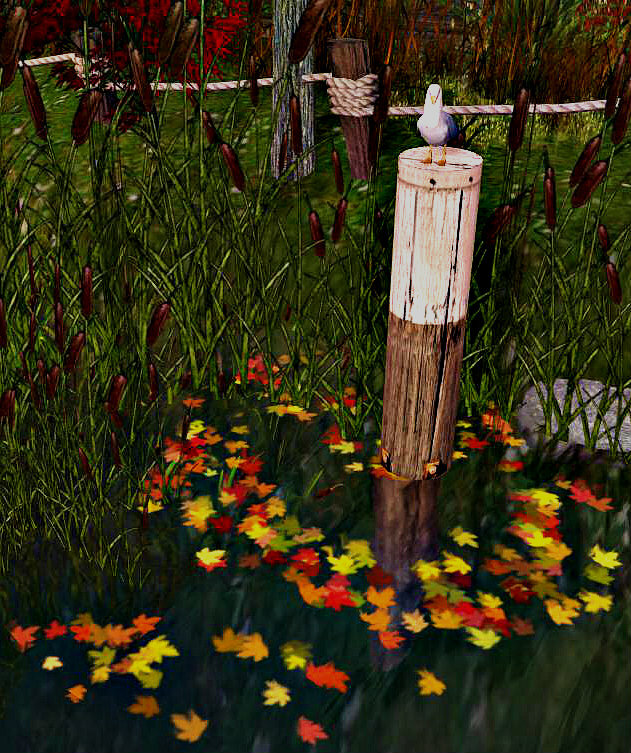 I love to wander around a sim and explore – and I was pleasantly surprised at each turn of the walking path. Waterfalls are evident all over the islands, with water features around the spa buildings adding to the ambiance and relaxation. There is a meditation area surrounded by waterfalls and pooled water. Water symbolizes purity, clarity and calmness – and I felt this as I enjoyed everything I encountered. Start at the landing point where you can get Camtasia’s prices and information about the Author’s Cuisine too. Treat your husband, your lover, your wife, your friends – or just get away for some alone time and treat yourself. Be sure to make reservations and be prepared to be pampered! Here are a few of the main landmarks to get you started…you should be able to go from there. Some areas are adult, some are moderate, be sure and check before you remove any clothing :D. Have fun! Right before winter sets in there’s that one day – when any leaves left on the tree fall to the ground all at once. Those are usually the brown ones, the ones that hold on for dear life as long as possible . .and then all of a sudden a big wind comes along and blows them all off! I try to keep a bit ahead of the leaf raking, knowing . . da da da DUMMMMM . . .that one day is edging closer and some cold morning I’m going to step onto the porch with my coffee and the ground will be covered. This is one reason I build a fire close to the center – some of them actually fall in on their own. Is there anything more wonderful than that smell of burning leaves in autumn? They do get everywhere though . . gutters, roofs, stuck in the water – eternally swirling until they turn brown and eventually sink to the bottom and become fish nurseries. Got photo bombed by our seagull on this one! I am sure he’s done it before so he’s getting good at it. 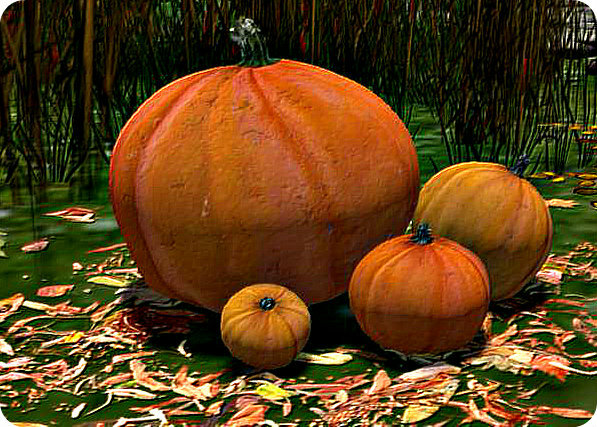 Ok . .time for the pumpkins. Love them so much and every time I find a pretty one – they go home with me. I set them around and enjoy how fat they are, the different shades of oranges, yellows and golds . . even the darker ones that are chocolaty brown. Found this baby snoozing in the flower basket but I’m always finding something – or someone – in the strangest places around our house.There are no pumpkins to speak of in Norway and it’s taken Zhoy some getting used to – all the pumpkins appearing everywhere. Three years on and he’s used to having them appear and even speaks fondly of them *cough* Calls them the Pumpkin Kings. He says . . “love you, love your pumpkins”. CJ is on the marketplace too! They named these pumpkins already at New Trails (Chico, Miguelito and Pablo) .a bit disappointing as I like to name my own . . . but I noticed they are the exact same names I would have chosen so I’m hap hap happy! These also come in purple. 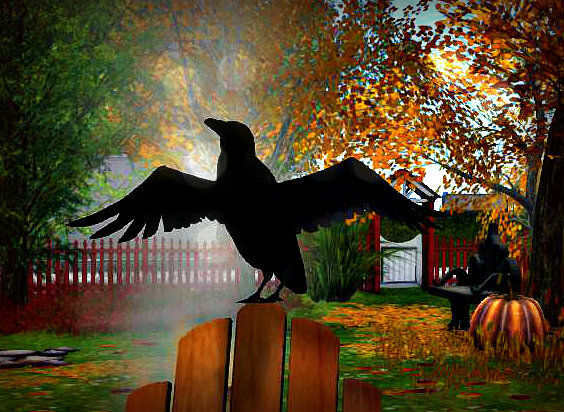 You’ve just GOTTA GO…..they have one of the best assortments of Halloween decorating stuff on the entire SL grid plus their sim is lovely. Autumn is my absolute favorite time of year. On September 1st I start switching my gardens and flower beds from late summer to early fall – a pumpkin or 2, some fall ground cover with a few seasonal plants and shrubbery – just to get things started and put me in the mood! The golds, reds, rusts, greens, yellows…..also my pick of colors for most anything so I get to be surrounded by everything I love in nature. 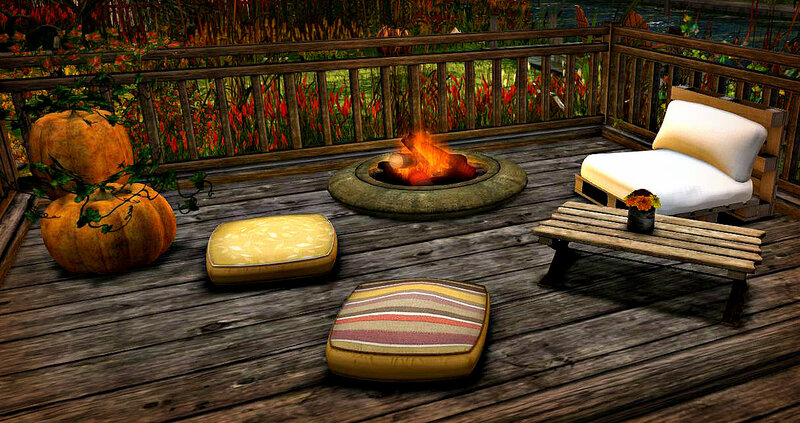 Remember when you are adding plants and flowers, layering is most effective. Start with your base flower or plants, then add other’s to fluff it up. You’ll know by checking from different angles when it looks great and you’ve added enough. We changed homes a couple of weeks ago and I’ve had some time to put a few seasonal touches around. One of the things I look for in a home – SL & RL – is lots of windows and attached outside space. This great Weekend Home from Starmark Creations was perfect for our parcel. 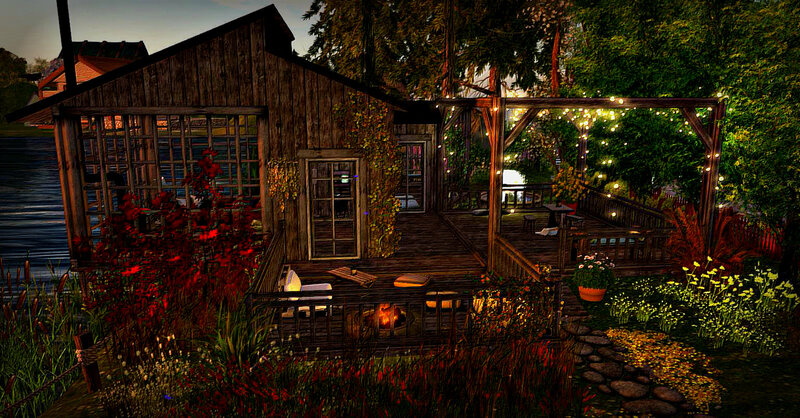 As shown, the count of 64 prims (which includes the inside wood stove and lights draped over the side porch frames) can be reduced but this is really low with almost zero lag! This is the back view of the home and the other side is a bedroom extension with the same fantastic walls of windows for our water views. We are outside a lot, but when the weather cools down we practically live outdoors. There’s nothing like a crackling, popping fire on a back porch or patio, some comfortable seating and good friends to make a fall evening more enjoyable. I’m really good at losing my weinie or marshamallow – sometimes even a s’more down in the fire so perhaps the hot toddies should wait until after the food portion of the evening? 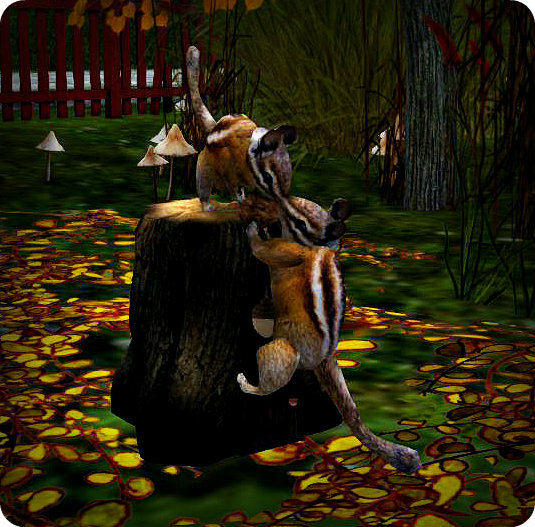 I’m hopping around the grid like a crazy bunny looking for businesses that have put out their fall items. Most of these are from last season, but are still available. As soon as the 2014 offerings are out in full, I’ll be back with some changes and new thing!